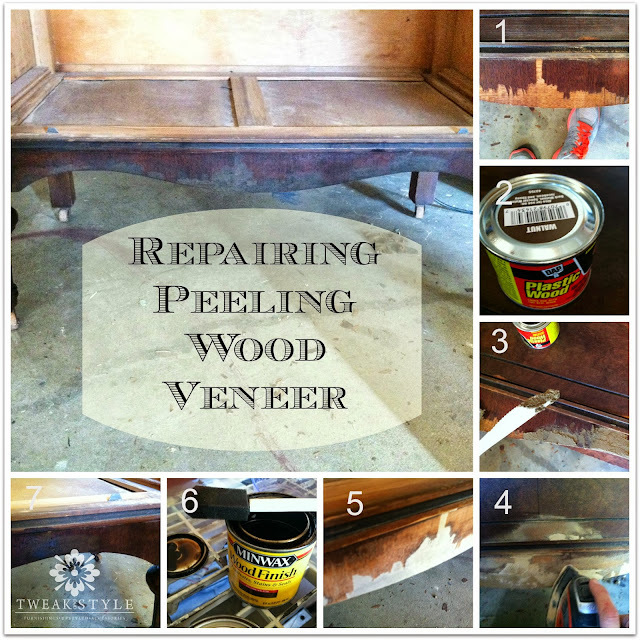 Here is a simple step by step tutorial on how to fix peeling wood veneer. This technique is best used for furniture you will be finishing with paint. Peeling veneer can become a big mess! buying for loose or peeling veneer. you may want to reconsider. On this piece, the peeling veneer was localized to the bottom trim which made it manageable. Since veneer was already coming off, I removed any more loose veneer. 1. Here, I gently pulled up any more loose veneer from the already missing wood veneer patches. 2. For the repair, I used DAP Plastic Wood filler which is "a high performance wood filler that hardens to give a surface and body that looks and acts like wood". 3. Apply the DAP wearing rubber gloves and with a plastic knife for easy clean up. Spread the fill over bare areas leaving the now coated area raised so you can sand down to level later. I also used my gloved finger to press the wood fill into spots because sometimes during spreading the putty wants to pull away with knife. Using your finger to press into each spot helps it sticks. 4.After the wood filler has dried (approx. 1 hour but I usually five longer), sand it down with sander. Feel for smoothness as you do this to make sure the area is level. 5. After sanding the wood fill level with original veneer, the finish will feel smooth and unified. Look how nice this looks compared to image 1. 6. Because I want to paint and distress this piece (and some of the wood may peek through), I used a foam brush to apply Minwax stain and sealer to match the original dark finish. 7. Once the stain is dry, the area where the wood veneer had been missing is smooth and unified and ready to paint. great tips! i saw you rsvp'ed for saturday- can't wait to meet you!!! i am hoping it's not too far for you, because i would love to have you as a vendor.... hint hint! 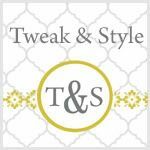 We ended up filling, sanding then painting over chipped veneer on our dining room chairs bc it was such a mess! wish we could have repaired them. :( great post! If I'm just going to paint over the filler with chalk paint, do I have to stain over the filler first? Thanks for sharing these nice tips with us. Those are beautiful. good job.